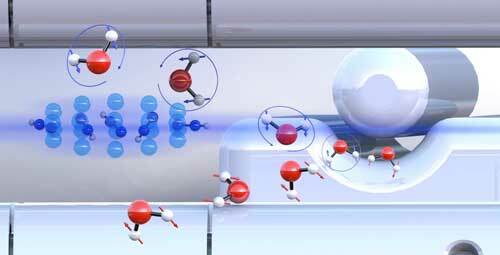 (Nanowerk News) Water molecules exist in two different forms with almost identical physical properties. For the first time, researchers have succeeded in separating the two forms to show that they can exhibit different chemical reactivities. These results were reported by researchers from the University of Basel and their colleagues in Hamburg in the scientific journal Nature Communications ("Observation of different reactivities of para and ortho-water towards trapped diazenylium ions"). The research group headed by Professor Stefan Willitsch from the University of Basel's Department of Chemistry has investigated how the two forms of water differ in terms of their chemical reactivity - their ability to undergo a chemical reaction. Both isomers have almost identical physical properties which makes their separation particularly challenging. This separation was made possible by a method based on electric fields developed by Professor Jochen Küpper from the Hamburg Center for Free-Electron Laser Science. Using this approach, the researchers were able to initiate controlled reactions between the "pre-sorted" water isomers and ultracold diazenylium ions ("protonated nitrogen") held in a trap. During this process, a diazenylium ion transfers its proton to a water molecule. This reaction is also observed in the chemistry of interstellar space. In their experiments, the researchers worked with molecules at very low temperatures close to the absolute zero point (about -273°C). These are ideal conditions to precisely prepare individual quantum states and define the energy content of the molecules, and to cause a controlled reaction between them. Willitsch explains the experimental approach: "The better one can control the states of the molecules involved in a chemical reaction, the better the underlying mechanisms and dynamics of a reaction can be investigated and understood."